According to a recent report, it was informed to the Indian parliament that E-commerce is covered under the Consumer Protection Act and that the government is not going through any kind of loss in indirect tax revenue due to expansion of online retail business. “E-commerce operations are already covered under the Consumer Protection Act, 1986,” Minister of State for Food and Consumer Affairs Raosaheb Patil Danve said in a written reply to the Lok Sabha. This he said in response to a query as to whether the e-commerce operations should be brought under the Consumer Protection Law or not in order to keep a check on complaints of cheating and other malpractices by such companies. As told by Danve trading of goods by e-commerce does not attract levy of service tax. “Goods which are imported/manufactured are cleared on payment of duty of customs/central excise, as the case may be, at the time of import/clearance from the factory. “Therefore, as far as the Central Government is concerned, there is no loss to indirect tax revenue due to expansion of e-commerce,” Danve said. The Consumer Protection Act that provides for better protection of consumers interest will now be covering ecommerce as well. Under the law, consumer forums have been set up for the settlement of disputes. 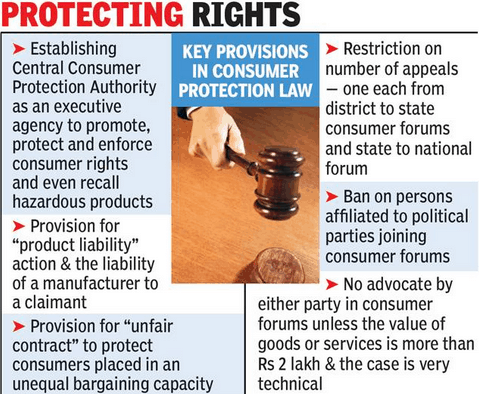 As per the sources, the government will also be introducing amendments to the Consumer Protection Act (CPA) 1986 in the ongoing winter session of Parliament to strengthen this law further.